When we holidayed in Scotland we called in at Tighnabruaich each evening because I could get internet access there and could send and receive messages. Our chosen spot was by the lifeboat station which meant we were there when the lifeboat was called out. It’s an inshore type. It was darkening as dusk turned to twilight. I was sitting in the car when I became aware that the lifeboat was being hauled out. It was pushed into the water on a cradle behind a special tractor. Once in the water the engine was started. As it set up its wake it nearly created the need for another rescue. That floating pontoon really did the rock and roll but the photographer out on it somehow managed not to fall into the briny. We saw the boat return, rather more sedately, when we were back at our holiday home in Kames. St Ives, Cornwall – home of artists and haunt of holiday makers. We were amongst the latter in the spring of 1973. It may have been a chilly day around Easter time, but St Ives was crowded with people. Quite unexpectedly, a couple of explosions were heard over the town. The maroons had gone up. Lifeboat men were summoned to action stations by the sound of the explosions. What followed seemed odd, to say the least. From somewhere, a heavy caterpillar tracked tractor came, hauling a lifeboat on a caterpillar tracked trailer. This processed along the seafront street, amongst us gawping tourists. 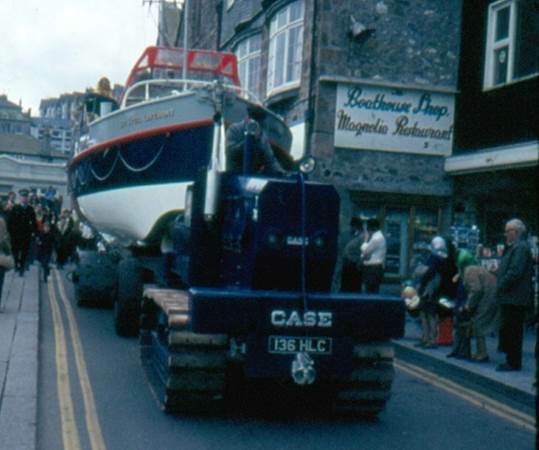 When the tractor/trailer/lifeboat convoy reached a slipway it reversed down it until the lifeboat was in enough water to be launched. 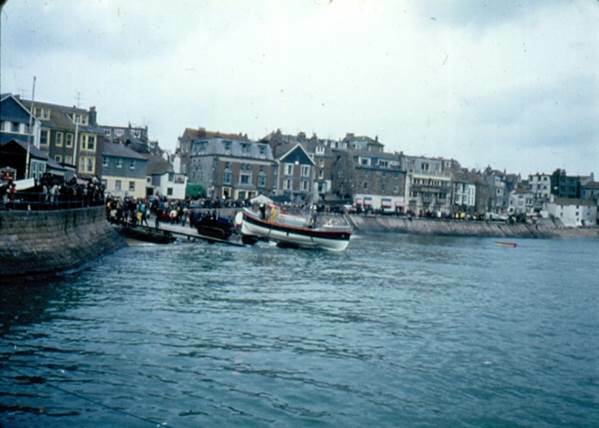 One’s thoughts turned to whoever was in distress and desperately waiting for rescue as the slow lumbering set up navigated the narrow St Ives streets before the lifeboat could be launched. I can report that by the time we left St Ives, the lifeboat had returned with no sign of any distressed people. Perhaps it had been a training exercise.